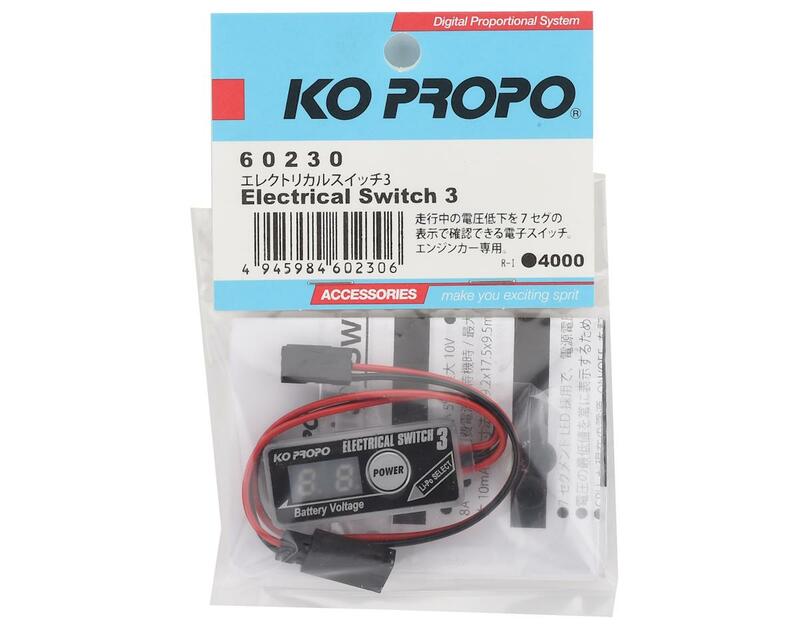 This is the KO Propo Electrical Switch 3 with an LED Voltage Display. With this switch, the CPU remembers the current ON/OFF power state, preventing the power supply from turning off due to poor connector contact, by vibration in the model, or from momentary or voltage drop at overload. Voltage displayed by the 7 segment LED: Built in 7 segment LED to easily see the battery voltage monitoring. The current battery voltage is displayed for 5 seconds one the power is turned ON. After 5 seconds, the minimum voltage is always displayed. So, the voltage at the time of the voltage drop during running can be easily confirmed. Translucent case: Since the switch features a translucent case, you can judge the ON/OFF state of the power supply from the side of the switch. 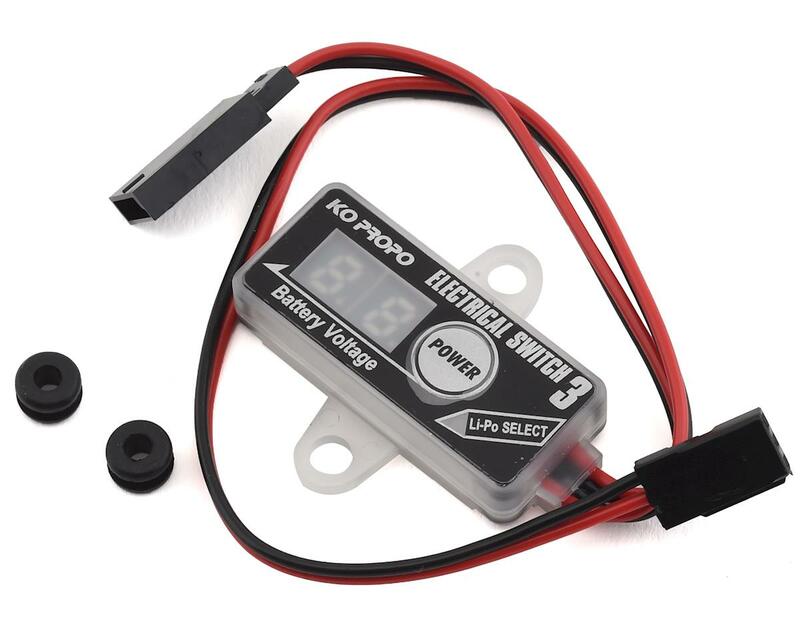 LiPo mode for safety using: This is a function to prevent battery breakage due to voltage drop when using 2S LiPo battery (7.4V). When the battery voltage falls below 6.6V for 2 seconds, this product cuts output in the circuit and protects the battery. Also, when the battery voltage again exceeds 6.6V, output resumes automatically. Safety using for Engine car: This is have same safety function as like as previous product Electrical switch 2. This product employs an electronic ON / OFF switch which has high durability against vibration and shock of the GP car, so it avoids the contact failure which could occur in the conventional slide switch. NOTE: Be sure to remove the battery after using and when storage. Because, Circuit of products are using current when even power off. So,if this situation are long time, battery will be over discharge and broken.